Use our interactive maps to learn where immigrant populations are concentrated in the United States by country or region of birth, or explore settlement patterns and concentration of various immigrant populations in the United States in 2010 and 2000 with static maps. To look at a map, click on its title or thumbnail. Interested in how many immigrants live in your state, their countries and regions of origin, and their top settlement destinations by county? This map displays the state-level distribution of immigrants in the United States by country and region of origin, and also provides a county-level view of the immigrant population. Learn about top state and county destinations for unauthorized immigrants in the United States based on their country or region of origin, as well as those who are potentially eligible for the Deferred Action for Childhood Arrivals (DACA) or Deferred Action for Parents of Americans and Lawful Permanent Residents (DAPA) programs, in this interactive map. Use this dynamic map to display the largest concentrations by metropolitan areas for immigrants overall, as well as by region or country of origin. The colors represent the density of immigrants in the total population, and the larger the bubble, the larger the concentration of immigrants. This map displays the top origin regions of immigrants in the U.S. Hover over a state to view the total number of immigrants and their top region of birth. 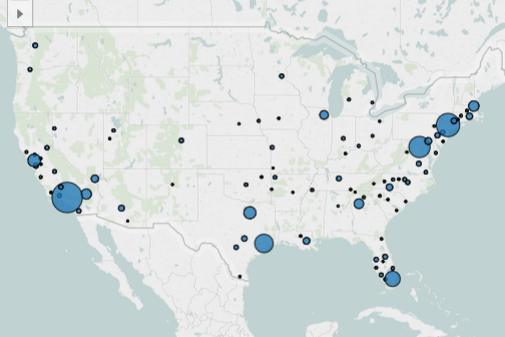 This tool shows up to top 15 origin immigrant groups for each of the 381 metropolitan areas. It also shows the rank that metropolitan area has for each of its top origin groups. 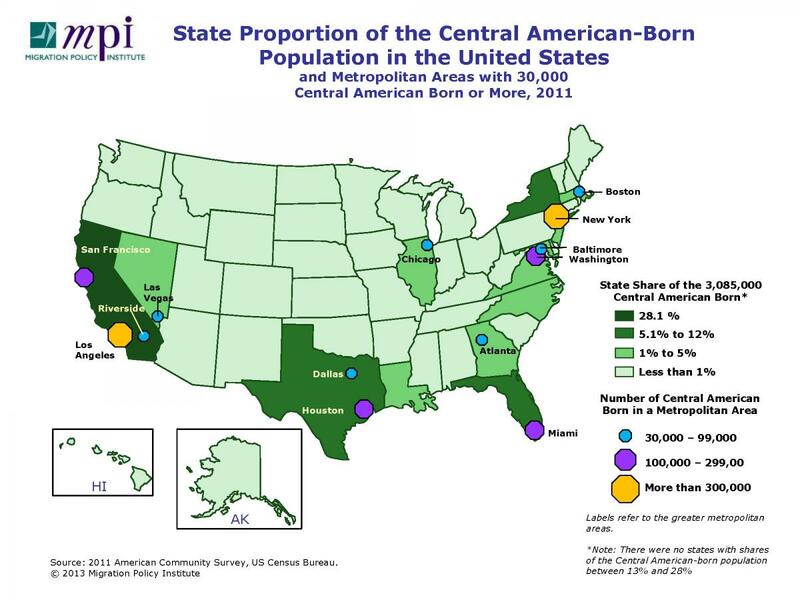 This map displays top areas of residence for foreign-born populations from El Salvador, Guatemala, and Honduras in the United States, individually and collectively by metropolitan statistical area (MSA). This map and ranked bar chart display the number of English Language Learners (ELLs) enrolled in a kindergarten through a 12th grade class, their share of the student population, and the number and share of children in immigrant families. 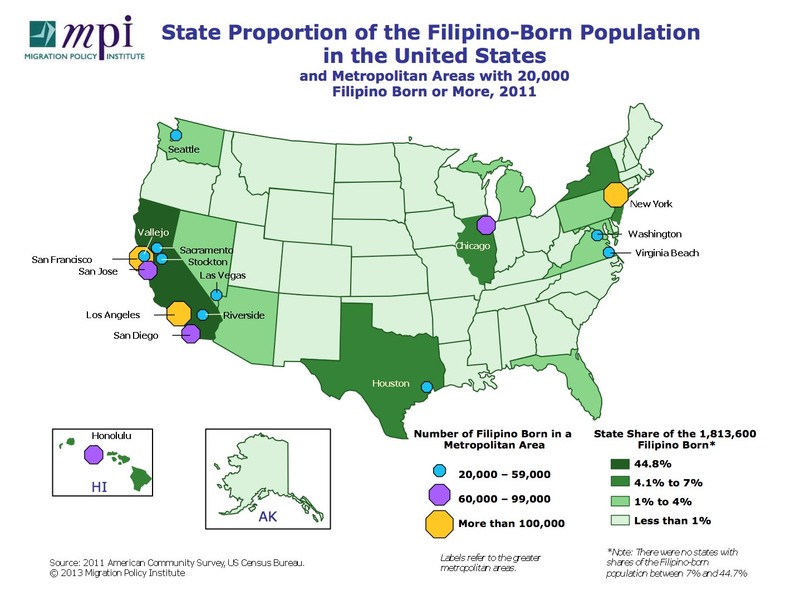 Below are links to the maps showing the distribution by state, county, and/or metropolitan area of the foreign born overall and of the eight largest immigrant groups according to data from the 2010 American Community Survey and 2000 Census. These maps demonstrate that the immigrant populations are not evenly distributed across the United States but are concentrated in certain regions, states, and urban areas. Due to compatibility issues, you may need to download the map to your computer in order for it to load properly. You might also need to download Adobe Acrobat Reader to view the maps. To obtain permission to reprint any of the maps, contact us at communications@migrationpolicy.org. Two in three immigrants lived in six states in 2010; North Carolina, Georgia, and Arkansas were among 10 states that experienced more than 280 percent growth of their immigrant population between 1990 and 2010. View state ranking tables. Check out our collection of Frequently Requested Statistics on immigrants in the United States. Below are links to the maps showing the number of immigrants from various origins by U.S. county according to the results of Census 2000. 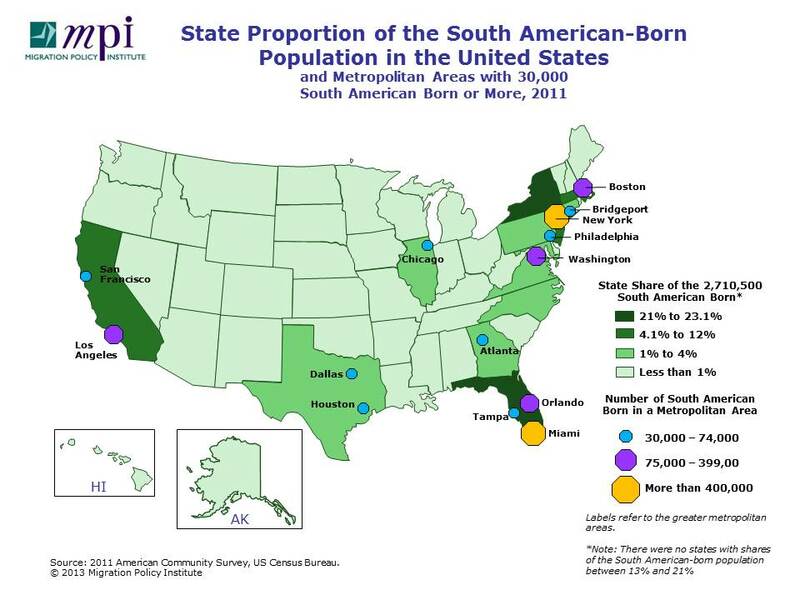 Read profiles of each of these foreign-born populations in the United States on the Migration Information Source. This pocket guide compiles some of the most credible, accessible, and user-friendly government and non-governmental data sources pertaining to U.S. and international migration. The guide also includes additional links to relevant organizations, programs, research, and deliverables, along with a glossary of frequently used immigration terms.